While the reason for this site is to pay homage to Omega Constellations of the 1950s and 60s, which I believe to be some of the best production watches ever made, I receive a constant stream of correspondence from visitors asking questions about other iconic Omega models of the time. If questions go beyond that of a trickle and there are no other sites dedicated to a particular collection, I customarily knock up an essay to fill the void. 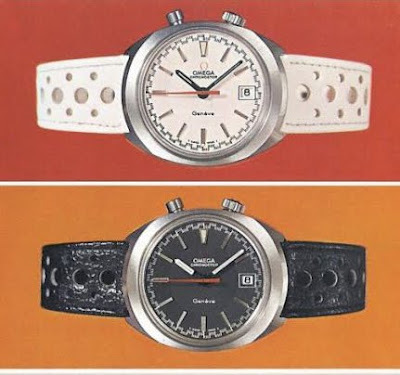 Such was the case with the Omega Chronostop, a particularly charming fusion of design and function from the 1960s. As I was gathering pictures of different examples of this model, I happened upon Steve Waddington’s excellent Omega vintage resource and discovered that he had already done the job! Under the title, ‘Omega Chronstop Wrist Watches’, Steve’s essay reviews comprehensively, in both words and pictures, the breadth of this elegantly designed stopwatch for the wrist. Click here to view it. The value of Omega Chronostops has risen quite markedly over the past two to three years, particularly for examples that feature the ‘Drivers Dial’ and retain their original finish. The 'drivers' models were designed to be worn on the underside of the wrist, and they most certainly deserve a place in any collection of 1960s Omega tool watches. thanks for the great quality of your blog, each time i come here, i am amazed. Love them all! !